I don't do programs Thanksgiving week - attendance is just too spotty and it's easier to take the whole week off rather than explain which days we're closed. I worked about 10 hours on Monday, a full day on Tuesday, and left early on Wednesday. We close at 5:30 on Wednesday and don't open again until Saturday. However this year I did get the 5th graders from our closest school coming to check out books. I was a bit nervous about this since they've only visited once a year in the past for a scavenger hunt, tour, and booktalking, but the teachers were enthusiastic, we needed the circulation, and I was just going to hope I had enough mysteries for 70+ kids. It worked out great - I'll do more booktalking next time, since we won't have a tour. Mostly this week was finishing all the shifting and getting ready for Paws to Read, which starts next Monday. See the shifting! Audiobook shelf, shifted and beautiful! When I first saw the cover of this book at ALA, I thought it was very attractive, but perhaps a bit too British. However, once I had checked it out I was won over by sweet Poppy. Poppy is thrilled about going on vacation, especially when she gets a pirate scarf to wear around her neck. But a real pirate dog needs a pirate ship! 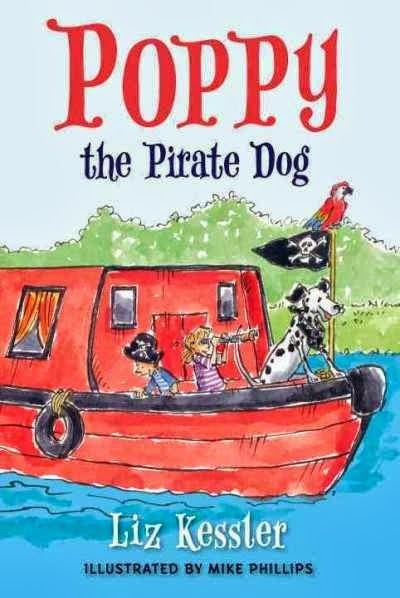 Poppy is certain that each new boat trip will be wonderful, but they all end in disaster...until she finds the perfect pirate ship for her. The book is divided into five short chapters with colorful illustrations on each page. Poppy is the central figure in both the text and art and her responses to her new experiences range from excited to humorous as she discovers that sailing isn't all she expected. The text is big and bold, with just a few sentences on each page, broken up by the art. This is one that falls exactly between an easy reader and beginning chapter book. Think Bink and Gollie, if you're trying to find a comparison in reading level. My general dividing line between when a book goes to the juvenile section and when it stays in easy reader is chapters vs. colored illustrations, but this book has both. I'd probably put it in the juvenile fiction, because it doesn't quite have the feel of an easy reader. From the description, it does sound a bit overly cute. However, Kessler is great at the light British mix of solid cute. Not twee, just cozy and happy. Poppy's disappointment each time "her" boat isn't what she expected and her delight when she finds the right craft are simple but satisfying. Verdict: Kids not quite ready for Down Girl and Sit will enjoy this easy but well-written story. Recommended. I'm really torn about this new series. So, it's one of those dance/friendship plots. There's a group of girls, The Dance Divas, and they're going up against another team of dancers. Unfortunately they've got their own personal problems too. The main protagonist of this story is Scarlett. She's worried about the new girl, Liberty, who seems to be more popular with Miss Tony. Liberty has a pushy mom who's designed costumes and routines for famous Hollywood stars. Scarlett's also annoyed with her little sister Gracie, who isn't handling their parents' divorce well. Her friend Bria is worried about school, especially since her mom thinks good grades are more important than dancing. Rochelle is kind of left out of the dance troupe because she does hip-hop and jazz and not so much ballet or group dancing. They have a big competition coming up and Miss Tony is pushing them all to excel, bringing each girl's issues and arguments to the surface. Of course, by the end of the story we learn that Miss Tony has her own friendship problems with the rival dance group leader, but she really just wants her girls to have strong friendships and focus on teamwork. Except...she never says or does anything about all the gossip and backbiting the girls partake in. She's very strict and makes it pretty clear all she cares about is winning, although she does say she doesn't want them to win unethically by spying on the other team. She doesn't explain why Scarlett is no longer dancing solos or offer her more help when Liberty starts taking her place as teacher's pet. There's a real mean girl flavor to this story that no amount of happy, feel-good endings could diminish for me. While the girls do come to a kind of agreement, there's a lot of hurt feelings and general meanness distributed that's never addressed. 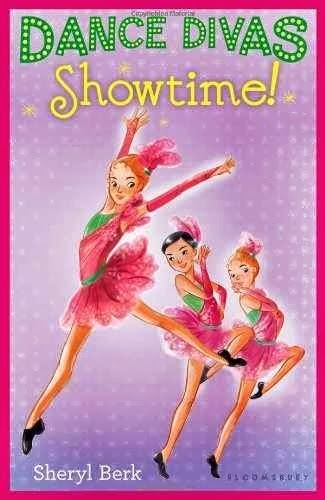 Now, I'm not in favor of didactic stories, but when a book is so obviously trying to teach friendship with a fun coating of pink sparkly dance, it should do a better job. As far as the dance, I am not a "ballet mom" as the author is, but a lot of things struck me as unrealistic. The girls seemed very young to be going on pointe and I couldn't figure out exactly what kind of dance they were doing; it also seemed odd that they would just co-opt Gracie to do a lot of dangerous-sounding acrobatics without even really asking her parents. Then again, this is kind of a dance fantasy, so maybe those details don't matter. It's like those series where the girls all go to expensive private schools and have brand clothes and accessories, only for dance. The final thing that bothered me was the stereotypes. None of the girls seemed like individual characters. They were just the average girl (except for being a redhead) who tries to keep everything together, the mean girl, who's being pressured by a pushy mom to succeed. The Asian girl whose parents only care about grades and studying. None of the girls seemed unique or really stuck in my head. Verdict: On the one hand, this would definitely fly off the shelves. Girls love these formulaic books no matter how old they are - look at Gossip Girl and Clique. It's pink and sparkly and the author knows what will sell a book; she's the author of the popular Cupcake Club and other celebrity projects. On the other hand, I'd rather hand the girls something like Whoopi Goldberg's Sugar Plum Ballerinas that's a little more realistic, not to mention diverse and closer to the middle/lower class income of my town. I'm going to think about it some more. Again, the cover is really attractive and girls do like reading these gossipy fantasies. I don't like being a gatekeeper and my objections are just the way I see the book. I don't know, I can't decide. The only professional review I've seen is Kirkus, and they pretty much agreed with me - stereotyped, but dance fans will love it. I think I will give the galley to some of my pink dance fans and see what they think. Welcome to Nonfiction Monday! Please leave your posts in the comments and I will arrange them in exquisite order throughout the day. It looks like we are going to have a great line-up, heavy on the animals and biographies as always though. Alas for the poor 001s, 200s, and 700s! Yay! Some more for our neglected Deweys! All right! These won't win awards but they will check out like CRAZY I can tell you for certain sure! The story of Sarah Josepha Hale, who helped make Thanksgiving a national holiday. A survival/animal story. Technically, even though they live in a zoo, dolphins are still wild animals. 600s: Applied technology, which in Dewey's world means farming and swords. And domesticated animals! If you can pet it, it's a 600. If you're all about animal friendships, this story of a bond between a dog and a fawn will make you awwwww. We have a 700! Get ready for winter sports! A review of a DK book about Kennedy with some personal comments from the blog author. Tara not only has some information on these two historical picture books, she also gives a look at some happenings at NCTE. Includes some interesting ideas for activities and other titles to pair with the book. I review a historical picture book! Gasp in wonder! A fascinating look at the capture of Eichmann. If easy, nonfiction read-alouds are some of the hardest children's books to write (and I think they are) then historical subjects have to be the hardest to tackle. Young children don't have any context for historical events or figures, most of which are oriented to adult concerns and ideas. I was skeptical about this book, although it features a train, since it tackles a complicated era in history (what historical era isn't complicated?) and I haven't always been a fan of Floca's watercolors in the past. I am won over, proved wrong, and in awe. Brian Floca has written a book that will appeal not only to the youngest of train fans, but also to history buffs, both young and old. The history of the railroad is framed around a journey a woman and two children take, going west on the train. As they travel, information about the building of the railroad, the various people who worked on the railroads and trains and the mechanical operation of the train itself are all woven into the journey. The book is written in flowing free verse, separated into chunks of text. The text is further separated by the watercolors sprinkled throughout the book, scenes of railroad stops, gazelles racing the trains, explosions, and the wild landscape that the train races through. You can pick and choose sections to read aloud to the youngest children, while they ooh and aah over the train-filled landscapes or read the book at one sitting with an older listener, especially one who can sit still for a long time. Independent readers will want to pore over the text and illustrations themselves, especially the history-rich endpapers, with information closely packed together. The book ends with a lengthy author's note and extensive sources. 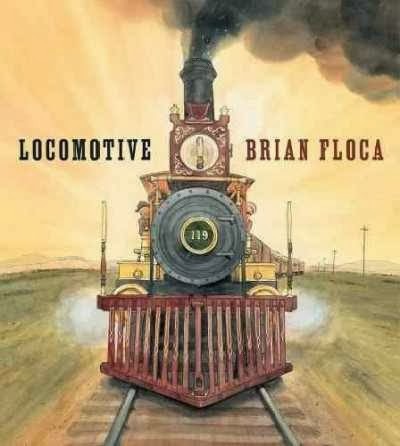 Verdict: This is a beautifully illustrated and accessible story of the building and growth of the railroad. It will be appreciated by both children and adults and find a wide audience. Highly recommended. Lots of stuff was happening this week, but nothing really noteworthy. Lots of moving things around and planning things and shifting things and discussions and LOTS and LOTS of budgeting for next year. 80 kindergarteners plus 60 "regular" people came to the Puppet Story Theater - I am so glad a neighboring library suggested this for storywagon last summer, and that I had a little extra grant money this fall! Barry was a well-known rescue dog and the inspiration for today's Saint Bernard breed. Believed to have rescued over 40 people, his life is a legend among dogs (heh heh). 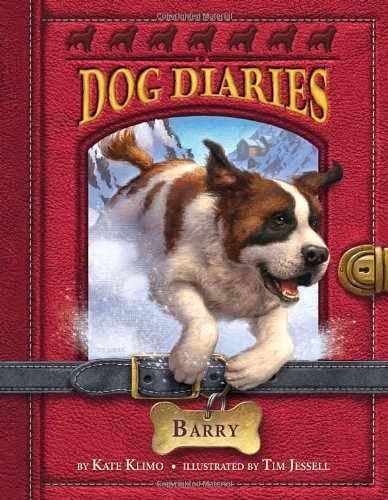 This book weaves the legends and sparse facts about Barry into an engaging narrative from the dog's point of view. Barry starts out by explaining where his breed came from and why they were in the Alps. His own story begins with his puppyhood in the basement of the Great Saint Bernard Hospice in 1800. He tells the reader about how he was raised and the Hospice, including encounters with Napoleon and various travelers. After many years of rescue work, Barry is injured by a confused traveler and loses his beloved friend. After that, he is taken to live with a kindly friend and eventually his body was stuffed and put on display in a museum. The appendix explains more about the history of Saint Bernards and the changes in the breed. There are several online sources for more information on Barry's history and the breed and some general information about owning a Saint Bernard. 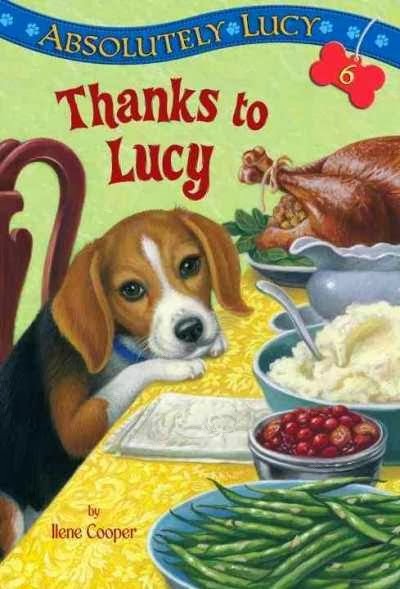 This is the third book in the Dog Diaries series. I haven't seen the first two, but from their description it appears that each book is about a different breed, not necessarily a specific, historical dog. The first book, Ginger, is about a fictional golden retriever named Ginger and puppy mills, the second book is about Buddy, the first seeing eye dog. Verdict: The blend of fiction and nonfiction is exactly what a lot of kids love. Join that with dogs, cute black and white pictures, historical drama, and a nice easy length and readability and this series will be a sure winner with your younger middle grade readers and beginning chapter readers ready to transition to a harder series. Recommended. I looked at some Lucy books a few years ago, but when I got a review copy of the sixth book in the series I was in the mood to zip through it. Lucy is a friendly if excitable little beagle, still not much more than a puppy. Her owner, Bobby, is a typical, if shy, little boy with all the fears, worries, excitements, and enthusiasms of a regular kid. 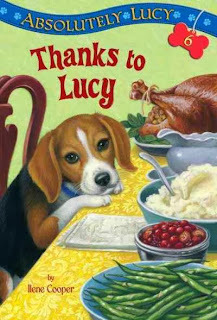 In the first book, Absolutely Lucy, Lucy helped Bobby break out of his shell and make new friends. Together they've gone through Lucy being lost, trying out for soccer, a dog show, and a little mystery at school. In this book, it's time for a new sibling. Bobby's parents are planning to adopt a baby and Bobby is worried. What if he's not a good big brother? On top of that, Lucy seems to be sick and everyone is so busy getting ready for the new baby and preparing for Thanksgiving that nobody has time to listen to Bobby's concerns. These are what I think of as fill-in series. They're not earth-shattering, particularly unique, or so well-written that they blow your mind, but they're perfect for what they do; keep kids reading and engaged as they build comprehension and reading skills to move to the next level. Each book has a simple "issue" but they're not overly didactic and Cooper has a good grasp of how real kids think, act and talk. Verdict: I'm working on building our beginning chapter series and I know this is a popular one that a lot of kids in school are reading. This was a good reminder that I need to add the whole series! If you have really limited budget, I would go with Down Girl and Sit for your token dog beginning chapter series, but if you have a little extra moolah, definitely add this one. ISBN: 9780375869983; Published 2013 by Stepping Stone/Random House; Review copy provided by publisher; Added books 1-5 to the library's order list. 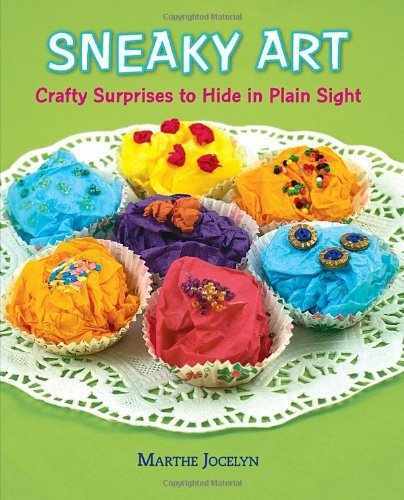 This book is full of adorable crafts, most of them miniature, that you can hide or otherwise use to pleasantly surprise people. The introduction cautions the reader that the art should not be vandalism or graffiti, that's it not permanent, messy, or damaging. Most of the projects can be done with just a few simple things like paper, scissors and glue. The artistry lies in the placement and presentation. There are several projects involving leaving collage faces, tags, and speech balloons in various places, including libraries. Yarn bombing is briefly referenced and there are a number of suggestions for miniatures. The photographs are bright and cheerful and the projects very clearly arranged with suggestions on where to leave the projects, materials needed, how to make it, and any additional sneaky instructions on placement that are needed. There are some templates on the endpapers. After reviewing in my mind my patrons, I don't think I'd put this book in the general collection. I can see the warning about graffiti going right over their heads. It's also spiral-bound, which won't last long. However, there are quite a few projects I'd like to do with the middle schoolers and as stealth programs. One I especially liked was having kids write book recommendations on speech balloons and stick them in books. I think the middle schoolers would have the dexterity to make a lot of the miniature crafts and since they usually don't want to take what they make home, would enjoy hiding them in the library for littler kids to find. Verdict: Probably not something for the general collection, but I'd buy it for my professional collection and will do so as soon as I have the money. Also thinking about ways to get around over-crowding in some storytimes and low attendance in others. I'm thinking seriously about shifting our 10am storytimes to 9:30 so that if we need to add a second session it will be early enough for people to actually attend. Registration is never going to work in our town - and I want to avoid it if at all possible anyways. Otherwise this week was pretty calm. I mean, there was plenty of drama, but none of it was new drama (other than the complete death and sudden, mysterious resurrection of my computer). It's still funny and Ursula Vernon is amazing. 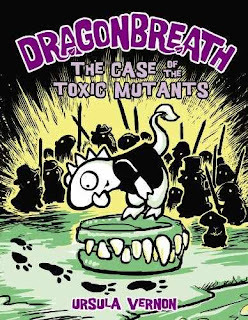 So, Danny Dragonbreath (the only mythical creature in a school of reptiles who's still working on his fire-breathing skills) collects his friend Wendell (complete geek, afflicted with a health food-addicted mother and a best friend who likes, ugh, adventures) and his frenemy Christiana (super logical, doesn't believe in dragons. Or fairies, even after the whole kidnapping episode) and goes to see grandfather Turlingsward. Not Danny's favorite activity, because his grandfather is the epitome of all that is grumpy and kid-hating. Danny is even more upset when they arrive and it turns out they're going to have to do some detective work; Grandad's dentures have been stolen. For a dragon the size of a house, that's a seriously large theft. Things look up right away though, when mysterious creatures start appearing and disappearing and they discover there's been a lot of mysterious thefts. Even though Wendell and Christiana make Danny go to the library to do, gasp, research, it turns out to be more fun than he expected when he discovers an awesome book about detectives through the ages. Danny comes up with an idea to trap the thief and when the three follow him down a dark tunnel (Wendell isn't happy about this, but he's even less happy about having to tell his mom his new retainer was stolen, so he goes along) they discover an awesomely terrifying world of toxic mutation. Vernon is as wackily hilarious as ever with snarky asides on everything from pre-regulation hospital toxic waste to respecting (or not, as the case may be) the elderly. Not to mention yard decorations, pack rats in little hats, and the triumph of reality over logic. If you haven't read Dragonbreath before, it's what I think of as a blended graphic novel, with short comics, art, and speech bubbles integrated into the text. Verdict: You don't have the whole series? Why the heck not? Get out there and fill it in right away. You might want to buy a couple extra copies of the first book while you're at it. This is my go-to series for parents who want their kids to read "real" books when the kids adamantly want to read comics. It's also great for kids who like wacky humor, it's an amazingly easy series to booktalk, and even down the line as far as book nine can still make me laugh. Every library should have a complete set of Dragonbreath! I will admit, quite frankly, that I mainly buy mainstream, popular books. I try to keep a balanced collection, but when it comes down to brass tacks I need books that will circulate frequently and that the majority of people will check out. However, that doesn't mean I can't occasionally add a book that will be special to just a few people. I don't necessarily think these lower-circulating books have any more literary merit (and frankly I wouldn't care if they did) but there is a certain amount of "I'll buy 5 cheap Barbie paperbacks and then I can buy something a little more esoteric" in my thinking. One of the illustrators I like to indulge in is Isabelle Arsenault. Her art is beautiful but not necessarily the thing most parents will grab off the shelf when they're looking for something to read to their kids. 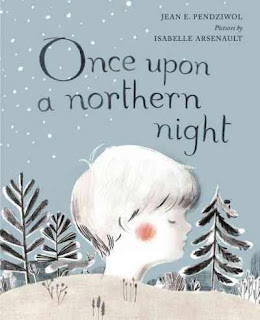 Verdict: While my town isn't quite far enough for pine trees, we certainly have our share of winter snows and I think this will be a lovely book for some special readers. It won't rival Llama Llama in circulation, but may just find a nook in that one child's memory. If you have the budget, I'd make this your "special" purchase of the month or year. Most people are familiar with the California Gold Rush, but fewer know of the Klondike gold rush, nearly fifty years later. Told primarily through source documents, this is the story of the experiences of two men hoping to strike it rich. Stanley Pearce and Marshall Bond start out their journey to the Klondike with enthusiasm and optimism. Both have experience in the mining industry and their fathers provide capital for what they are sure will be a highly profitable expedition. They start out in advance of the crowd and things are going well, until they hit the first mountain pass. 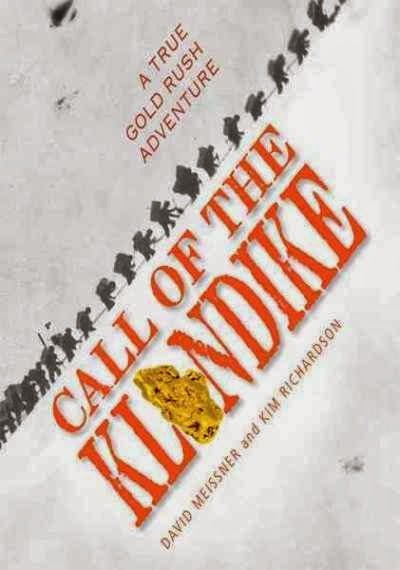 Gradually, their letters and and reports change to a more grim outlook as they encounter more and more troubles and dangers and by the time their year in the Klondike is over, they're more than ready to return home, without the rich reward they so eagerly expected. Most of the book is composed of excerpts from the two men's letters and diaries, as well as some of the newspaper reports written by Stanley Pearce. The original documents are connected by brief introductions and explanations of the various events and people referenced in the source materials, as well as additional facts about life during the gold rush. Additional information, such as a timeline, authors' notes, and a brief discussion of the effects of the gold rush on native cultures are also included. I'm in two minds about this one. On the one hand, I found it interesting and the source documents are fascinating - Kim Richardson is the great-great-nephew of Stanley Pearce and supplied all the original documents. There's not a lot written for kids on the Klondike gold rush and I really liked the way the documents were excerpted and the narrative woven together to show the struggles and gradual disappointment. On the other hand, I'm worried that kids used to more fast-paced history and fictional adventures will find this bland and boring. Most of the letters were written to their parents and in the stylistic conventions of the time the more "exciting" events were downplayed. The whole book is pretty low-key and slow-paced. Verdict: Although it's well-written and I like the layout, I'm doubtful about its kid-appeal. This week at the library; or, the ideas are just popping! Pre-work work - laid out a plan for my department's new positions, hiring schedule, etc., visited Game Stop to talk about suggestions for adding a new format of games to the library. PS3 seems to be the best option. Emailed back and forth some plans with Pattie. Actually at work now - monthly report, weekly newsletter to staff, minutes from all staff meeting last Friday, collection development project, clean off desk and put away all the stuff I bought last Friday, hauled in the laundry (yes, I never thought I'd say that either), finished most of the publicity through the end of the year, updated all our digital photo frames. Actually at work now - finished most of the programs through the end of the year, made book bundles, started some weeding, complicated av order for my director (I am the queen of Amazon), worked some more on my collection development project, drew up new plans for the children's area. Dealt with sudden schedule drama as I suddenly realized we have nobody to do Books 'n' Babies on Thursday, or next Thursday. Worked on my art and stories program series for next year a little. Went through some stacks of new books. After-work work - drew up a brief Facebook poll. Our toddler storytime is getting out of hand again and I want patrons' feedback while the chaos is fresh in their minds. Prepped for storytime, put several carts of picture books in order, storytime, chatting with parents, more new books, discussions with my director about various issues, phone tag with a teacher, middle school madness, clean-up, and done! Budget discussions, set up fifth grade visits (phone tag from yesterday), various collection development things, decided to try a poll on facebook and see if we can switch toddler times to a better slot than 10am (to which everyone is crowding again) and 11am (to which hardly anyone comes), a couple hours on the information desk, then had to clear everything off the youth services desk b/c the city guys are going to take my desk top and round the corners! Yay! No more small heads careening by sharp corners! Happily, our head of circ unhooked the computers for me, which was very nice. Especially since for a number of reasons I had missed most of my meals and felt pretty sick as a result. Only 20 people at Lego Club. Not sure if this is the natural ebb and flow of programming or I need to send more marketing to the schools. Probably a combination. After-work work - made the mistake of checking Facebook to see what the toddler moms thought about the times. Not that anyone was rude at all, but these things always make me stressed b/c somebody could get mad and then I would have to deal with it and be stressed and...yeah. Stressed. The big thing today was Kohls Wild Theater. I always invite all the 4K classes from the biggest daycare/preschool/4k, which means about 80 kids plus all the families who come on their own. Last year the 4K kids came early and we split them into two groups and did tours. I think. I can't really remember exactly what we did last year. The school coordinator thought the teachers ran some tours. We decided to talk about it later, closer to the date. On Thursday I suddenly thought "hmmm....we never talked about it." So I came in before 9, prepared for anything! I grabbed a staff member to help me break down all the tables and then at 9:30 the kids showed up, so I went and got my director and was all "so, hey, you are running two back-to-back tours for 35 kids!" and she was cool with it, which is why being a small library is nice! We had about 60 people in addition to the 70 kids and teachers, everyone loved the show and it was All Good. Then I weeded the entire juvenile reference section (all two shelves of it) b/c I'd already pulled it off yesterday b/c of my desk being under construction and it's almost all 10 years old and covered in dust. I put our newish World Book back to circ and a couple other things and that's it. Then a couple hours on the desk, then I did all the end of year weeding of the magazines, moved the back issues to a new place, and relabeled boxes! Phew! After-work work - collection development for about an hour. Because it's relaxing. Anna, at Future Librarian Superhero, is inviting people to write their stories of how they became librarians. I don't really have an exciting story...it never occurred to me that I wouldn't be a librarian. When I was about 12 I started cataloging my personal library, by the time I was 16 I was creating personalized reader's advisory lists for local homeschooling families and had convinced my dad to turn my closet into a mini library (no word from my sister on how she felt about keeping our clothes in my mom's closet. hey, she got at least FOUR shelves!) When I was 17 some people who knew of my interest recommended me for a cataloging project in a church/school library. I had decided when I was a teen that I was going to work maybe in Boston, b/c the library there looked cool. I volunteered in a large public library and a high school library in college and decided that what I really wanted to do was work in a small public library so I could do lots of different things. I interned/worked in a lot of different places in graduate school, just in case I developed a sudden love of academic libraries (I didn't) and then I got pretty much the job I'd always wanted. A couple years after I'd started there, I actually went out and interviewed at a LOT of different libraries, like maybe 15? b/c I'd pretty much taken the first offer I'd gotten and in the end I decided that, although someday I'd like to work in the Puget Sound area (and the Sno-Isle system is AMAZING) I'm pretty happy just where I am. This is a little longer than I'd usually like for a picture book, but it's so good that I'll overlook that and use it with kindergarteners. Nora is miserable when she and her parents and toddler brother immigrate from Russia to America. There are no trees on the prairie, no hills and worst of all, no friends. She briefly meets a girl from the neighboring farm, but they're both shy and she doesn't feel like a friend. As they slowly make the prairie their home, each member of her family finds where they fit and meets a friend, from dogs to cows. But not Nora. Then her father gives her a flock of chicks and ducks and suddenly Nora isn't alone any longer. 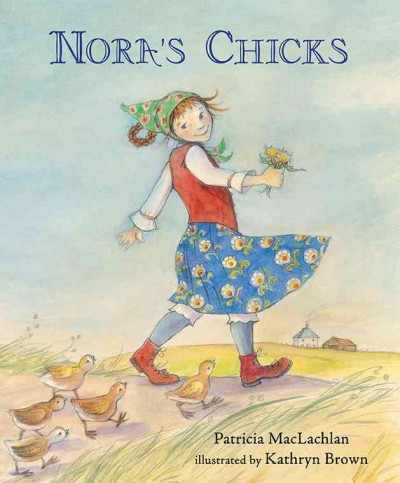 Gradually, she makes the prairie her home as well and finds friends with the help of her beloved chicks. What I like about this, and why it's different than most of the historical picture books I turn my nose up at, is that it's relatable. There's no mention of how Nora is probably suffering from culture shock, how different America is from Russia. Rather, the story focuses on how hard it is for her to move to a new place where she doesn't know anyone and where things are different than what she's used to. Kids can empathize with having to move to a new place and even those kids who haven't moved will understand the longing for a friend and something that belongs just to them. Kathryn Brown's illustrations are soft and colorful. Her watercolors deftly include the motifs of Nora's Russian heritage, but the simple clothes and landscapes have a familiar feeling and the soft focal points of animals in many of the pictures will catch children's eyes. Verdict: If, like me, you only buy a few picture books for older listeners I would definitely make this one of them, especially if you live in the Midwest. Pair this with Elsie's Bird by Jane Yolen for a storytime about pioneers (or birds). In a world where almost everyone has a special Talent, anything can happen and in this story it does. An orphan with a Talent for baking cakes, a mysterious man who arrives and disappears without warning, an embittered old man with a secret, and a young girl desperate to find her Talent, all come together, along with a host of other characters, to become part of a story of redemption, family, and Talents. It's impossible to avoid comparing this book to Ingrid Law's Savvy. Both feature quirky Southern characters, small towns, quasi-magical Talents, family secrets, and spunky girls trying to find their place in the world. Savvy rose above its genre (no, I am not a fan of Southern Quirk) with warm, true characters and a skillful blending of plot and emotion. 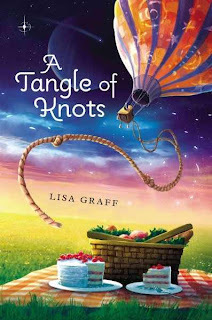 A Tangle of Knots however, is just that - a tangle of inter-relating stories and characters. The book hops so quickly from one story to another that the reader never gets invested in any one person and the array of Talents, quirks, and characters is confusing. There are pervading themes, most especially that of redemption and moving past mistakes, but there's so much else going on that it's hard to keep track of the underlying plot points. That being said, is this a bad book? No, not at all. 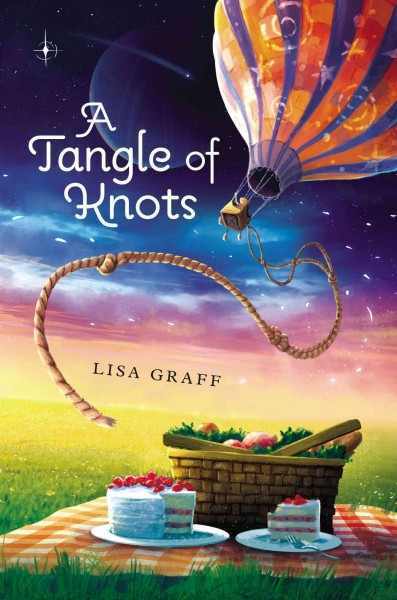 It's exuberant and cheerful and has lots of fun characters, talents, humor and a fair dose of excitement, not to mention plenty of cake recipes. 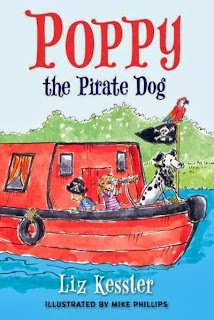 Fans of Savvy and Scumble will be delighted to have this read-alike which they'll easily identify by the colorful cover. Verdict: If you have Savvy fans, buy this. I did and it's been circulating briskly. In 1941 American joined War War II to fight for freedom. But there wasn't much freedom in America for African-Americans, even in the army. Black soldiers were restricted to cleaning, cooking and other menial and often dangerous chores; like loading ammunition. In 1944, a partially-loaded ship exploded. 320 sailors and civilians were killed and close to 400 were injured. 202 of the dead were black sailors. A few weeks later, the survivors were ordered to continue loading ammunition, with no additional safety measures or training. They refused and sparked a controversy that ended with 50 sailors being convicted of mutiny and the eventual desegregation of the Navy. 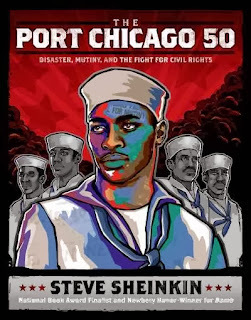 Sheinkin doesn't shy away from the grim reality of life for black soldiers, prefacing his story with a context of segregation, discrimination, and even murder. However, he doesn't push the reader to a specific conclusion. Sheinkin offers a compelling narrative from the stories and memories of the survivors and other protagonists but lets the reader make up their own mind about what really happened and civil disobedience in the military and during war. In children's books especially, World War II is often portrayed as the "good war." Yes, horrible things happened, but the "good guys" and the "bad guys" were clear-cut and the good guys won. This isn't how I was taught history and I was shocked when I discovered last year a representative sample of adults and kids I was talking to knew nothing about the internment of Japanese-Americans. I was talking about this to our head of circulation, who to put it in perspective is a little younger than my mom, and she said they weren't taught the Holocaust in school when she was a kid. I think it's important to have a balanced view of historical events and get kids to read beyond the "good guys vs bad guys" type of histories, especially for this age group. These are difficult conversations to have and parents and teachers need to think carefully about when kids are ready to deal with the harsh realities of history, but at some point, history in all its warts and horrors should be taught. Verdict: This isn't an easy story to read, and there is some harsh language and harsh realities in the historical record, but Steve Sheinkin does an excellent job of writing his research in a way that's readable but not sensationalized. I usually booktalk Sheinkin's work to 6th graders, and while I wouldn't go with the publisher's age level of 9-11, since I think most kids that young wouldn't be able to understand the story, I think middle school is a good time to introduce kids to the complexity of history and I would give them this book, even if it's a difficult read. Due to the language, I will be putting this in our teen area. This week has been rainy, foggy, and just vaguely dismal. Average to low turn-outs - I think more kids came to the teen movie than to Messy Art Club! and just generally exhausting. We were closed on Friday for our staff work day - I joined in the basement cleaning project. That's about it...still working on winter reading, collection development projects, planning programs, etc. Anton and Cecil are brothers, but the two cats could not be more unalike. Cecil is an adventurous black cat, big and bold, and instead of being scared by the tales of cats being kidnapped to go on ships he rather thinks it would be an adventure. Anton, a small gray cat, really only loves music and can't even be bothered to catch food most of the time. 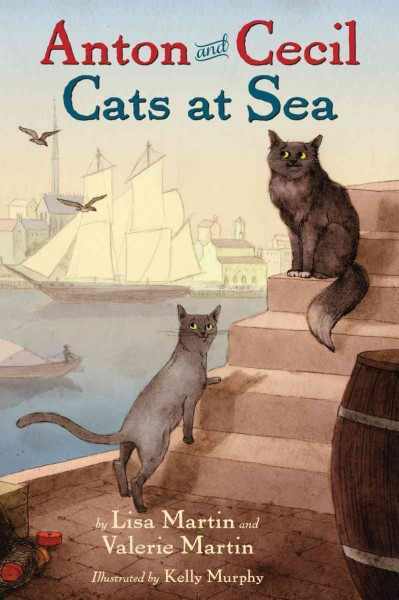 Despite Cecil's brief trips to sea on a fishing ship, it is Anton who is catnapped and stolen away and Cecil who must venture forth on a hopeless quest to find them. As they cross the ocean, a mystical prophecy of finding what they've lost when they see a cat's eye keeps them going as they endure shipwrecks, storms, pirates, deserted islands, terrifying creatures and a whale who may or may not be friendly. This story felt very old-fashioned to me, but I enjoyed it even so. Although some of the publicity bills it as an adventure tale, readers picking it up and expecting thrills and excitement will be disappointed. It's an older genre of animal story, where the animals are more anthropomorphous and the action is gentler, even when it involves something that could be scary like shipwrecks or pirates. It reminded me of the Doctor Dolittle stories with their special quality of mild danger, gentle humor, and enjoyment of simple storytelling. Verdict: This won't be for every kid, most of whom prefer the more genre-ized modern fiction but if you have fans of Kate DiCamillo they may enjoy this return to an older, gentler storytelling tradition.